CCMC has provided a range of commercial art conservation and restoration programs since 1989. Programs include conservation treatments and restoration of all types of materials: paintings; works on paper; photographs; books;frames; textiles; organic materials (such as leather, wood, plant fibres etc.) and inorganic materials (such as ceramics, metals, glass etc. ); archaeological materials; architectural projects; collection surveys and development of conservation strategy plans and disaster preparedness plans; technical analysis; research and training programs. CCMC has one of the best-equipped commercial laboratories in Australia, with access to a wide range of analytical equipment and expertise at The University of Melbourne. The building is purpose built for housing cultural collections with temperature and humidity control and 24-hour on-site security, to ensure your artwork is in optimum care. Clients’ objects are covered under the University’s insurance while the objects are on CCMC premises. With access to a loading dock and large goods lift, we are able to accommodate very large items for treatment, such as over-sized paintings and sculptures. February 2014 - Dowling portrait of Francis Ormond to be exhibited in the Ballarat Fine Art Gallery exhibition " For auld lang syne- images of Scottish Australia from First Fleet to Federation" April 11-July 27. Painting was surface cleaned, removal of dust and dirt, fly specks mechanically removed. Painting was retouched. The frame was also restored, by removing the bronze overpaint. Painting was then rehoused in the original frame with a protective backing board. 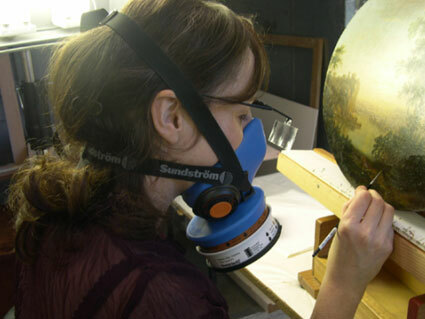 Mid 2013- Conservation of the Royal Portraits from Queen's Hall, State Parliament of Victoria. The two royal portraits from the Victorian State Parliament, Queen Victoria and Prince Albert, underwent extensive conservation treatment at CCMC. Both pictures were cleaned and restored, and the beautiful hand-carved frames were cleaned of years of grime and layers of bronze overpaint. TheRAAF badge, paint on metal, was stuck to the glass of a frame. This resulted in extensive loss at all four corners. Retouching using conservation-grade materials returned the work to its original condition. In late October, 2013, CCMC paintings conservators travelled to the Catholic College of Sale, in Gippsland Victoria, to undertake the conservation treatment of a Early 20th century painting by Girolamo Nerli. Ongoing project begun 2005 - 19th Century Prison Record, Archival Material from the Public Collection, Victoria.